Red Horse is a trio made up of Eliza Gilkyson, John Gorka and Lucy Kaplansky. • What percent of the general populace has to at least recognize all the participants’ names for something to qualify as a “supergroup”? • Are there really “supergroups” anymore, in this era of anyone playing and recording with anyone? • Is the term “folk supergroup” actually an oxymoron? • Is this just a clone of the “folk supergroup” Cry Cry Cry, in which Kaplansky was also a principal? The adoring folk fan will gush that Red Horse is a unique ensemble that has no predecessor. The slightly skeptical observer might intone that this trio is clearly based on the rousing success of Cry Cry Cry, of which Lucy Kaplansky was indeed a member (with Dar Williams and Richard Shindell). That group had the dual effect of being popular in its own right and also helping to re-energize the solo careers of its participants. The adoring folk fan might suggest that the material is simply wonderful on “Red Horse.” The slightly skeptical observer might point out that Cry Cry Cry at least did other songwriters’ material. 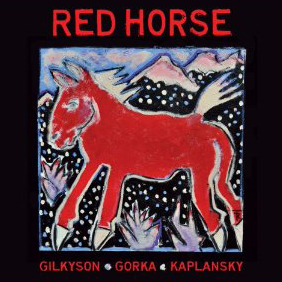 On “Red Horse,” though Gorka does contribute one new original, the rest of the material is made up of three covers; the remainder of the disc (eight tracks) is Gorka singing an older Kaplansky tune, Kaplansky singing an older Gilkyson tune, Gilkyson singing an older Gorka tune and round and round. It feels a bit self-congratulatory. John Ziegler has worked in the music industry for 36 years as a radio host, interviewer, record producer and professional musician.